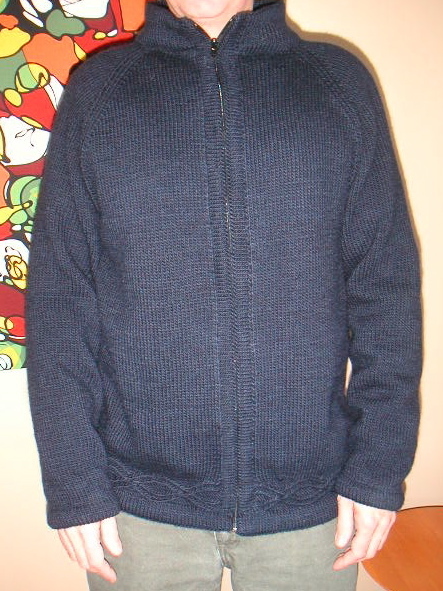 Here's the finished Avast sweater, modeled by B. I think it turned out pretty well. This is the first sweater I've made for him that actually fits. I thought it was perhaps a little too large, but he likes things a little roomier and it's about the same size as his jackets. As I was blocking the sweater, I noticed I had dropped a stitch, but luckily it was near the top and I was able to pick up several stitches and then blend it in with the sleeve decreases and then weave the ends in with the collar facing. Wow.........its gorgeous. You are such a fast knitter. Looks so warm too. Great for the weather.